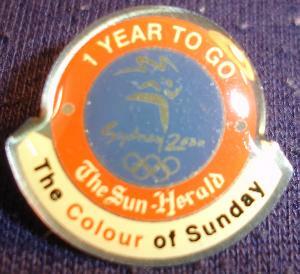 This pin-backed badge was only available with the local sunday paper - The Sun-Herald and co-sponsored by Westfield. It celebrates two years to go until the 2000 olympic Games. 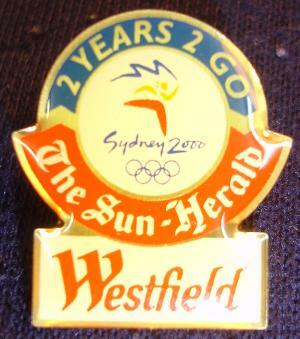 This pin-backed badge was only available with the local sunday paper - The Sun-Herald and co-sponsored by Westfield. It celebrates one year to go until the 2000 olympic Games. 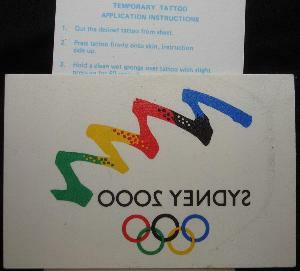 This is a temporary tattoo that was available here in Sydney during the 2000 olympic Games. The design is about 4cm wide. © 1st August 2002 Robian, all rights reserved. Last updated 25th June 2010.